Valentina from Spain. Sent 11 Jul 2011. I felt relaxed and comfortable from the beginning. Boy in the bar extremely nice. He does a coffee just as I like. Was the last place I went before leaving Amsterdam. Would like to come back. Really good prices here and fairly friendly service. In De Pijp. Take tram 4 from Central Station get off on Centuurbaan walk back after exiting the tram and look for Febo on the corner, same street. Example good prices: 4 grams of Hawaiian Haze was 15 Euros. Compare this to spending 15 euros for 1 gram at a big, popular coffeeshop. If you are a heavy smoker like I am the deals are really good deals. My advice, take the risk of getting lost only for a moment and find the smaller gems, they are worth it and you can smoke more for your money. Good coffee, Maroc style, comfy and relaxing, reasonable prices and internet available. Worth a visit for sure. Alex from Wales. Sent 18 Jul 2009. Not quite sure to sure where to start with this place. I found it by luck on my first day in Amsterdam. It's just off the main high street and you can identify it by a little '@' logo coming from the wall and maybe a couple of guys standing around the outside. I spent most of my days in there. 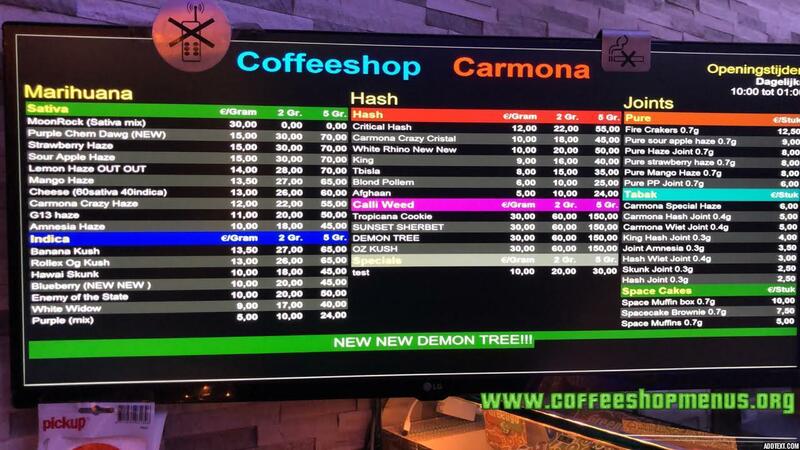 They had a really good selection of marijuana and hash and for very low prices (5g of silver haze for EUR35). The chill out area was great. Several big, comfortable sofas with a very Moroccan theme. Along the walls above the computers there were shisha pipes. I'm not sure if you can use them though! They've got a small TV which is always on and a fairly good selection of music. There're 2 game machines, one of which seemed to have a woman with dreadlocks playing it all the time. They charge EUR2 for an hour on the computer. Full internet access, MSN, webcam and mic. The place is aircon'd so it's always a nice temperature in there. There's a fag machine inside the front door which has a fair selection if you need something to mix with your smoke. Highly highly recommended. Glen from UK. Sent 30 Aug 2008. This shop is a little gem close to the Albert Cuyp market. The interior is spacious, clean and tastefully decorated in Moroccan style. There is internet access from at least 6 PC's so waiting to check your mail is no issue. The shop is run by some of the most hospitable people that I have encountered anywhere in Amsterdam; Moroccans run some of the worst but also the best shops in the 'Dam. This shop is first and foremost for locals. This means that the menu is not extensive but what is on sale is excellent value for money. Of the weeds I tried the Carmona Special was the best, decent weed that is fertilizer-free and gets the job done. The Hawaian Haze was disappointing, tasting like it had been harvested 1-2 weeks too early. The hashish however is excellent and a great buy. The house-special was a top-shelf, medium-dark pollum style hashish that scored top marks for flavour and potency. You might find a marginally better hash at the blue-label shops but at much greater cost. Swarmi from UK. Sent 7 Sep 2006. We decided to leave the hotel and head out on foot, and this was one of our accidental findings. Décor is as described, cat et all. The best thing about this place is after we got stoned, we played the video games! Street fighter alpha and about 50 other games. Smiling plump lady working at the time. Net café as well. Lee and Batty from England. Sent 31 Aug 2006. Me and me mate found this coffee shop to be excellent value for money and excellent service and nice and quiet. We are heavy weed smokers in our prime 23 and 24 and of course we both bought 5 grams White Widow at 28 euros for 5 grams is a steal! It's very strong and that's the highest price you will have to pay at that shop. Laura from UK. Sent 25 Oct 2001. It was a quiet place down a side road with art work on the window so I thought I'd take a look. Lovely place, very friendly service which makes it that little bit more relaxing. They made a lovely cup of tea and made you feel welcome. Only thing is it is small but it is funky. Didn't know quite what to ask for so we asked for White Widow and he said strong or normal, stupid me said strong. Well, it knocked my head off. I was happy as I could get but I was so mashed I got lost on the trams for about two hours.